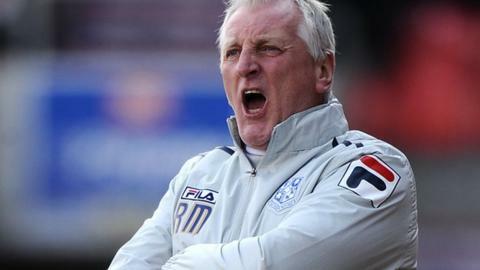 Manager Ronnie Moore says Tranmere's "embarrassing" FA Cup second-round exit at Peterborough was a major blow after their recent resurgence. Rovers had lost just once in eight games before Saturday's 5-0 defeat. "We were so naive. It was embarrassing, some of the defending at times. "I thought we'd got rid of those performances. In the last eight games we've given everything, and against a decent side we were found wanting," Moore told BBC Radio Merseyside. "If you look at the errors, it was the self-destruct button for us. In the end we were lucky it was only five. "It was an inept performance by us and I'd like to apologies to those people who came down and paid good money to watch it." The 60-year-old blamed sloppiness on the ball for the opportunities that enabled ex-Rovers trialist Shaun Jeffers to put Peterborough 2-0 ahead before half-time and things did not get any better after the interval. "With the quality of players who had time on the ball and gave it away, who made the wrong decisions in the wrong areas, it was suicidal at times. That was spread all over the team," he said. With Rovers just three points and two places above the League One relegation places, Moore has told his players they cannot afford to repeat the performance during the busy festive period. "We have our four cup finals coming up," Moore added. "They are massive games for us now with Carlisle, Gillingham, Shrewsbury and Sheffield United. Three of them away from home, and if you go anywhere away from home and perform like that then you know what's going to happen."